Thanks.I asked in the Email When The Sheris Halloween Party is gonna Be.I’m Dressing up as a Blonde Hooters Girl. This reply was modified 2 years, 7 months ago by m.ybarra55. want to see a picture of that. I’ll take a Pic. 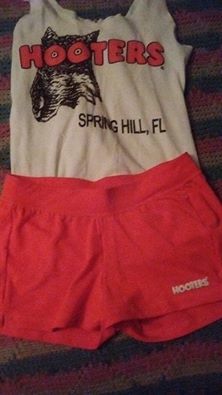 I dressed up as a Hooters Girl Last Halloween but in the Black Hooters shorts & black tank top. I was gonna ask Dena when The Sheris Halloween Party.If its late October, that’ll be right before I have Double(abdominal) Hernia Surgery . I found out this past friday. the 2 Buldges in my abdominal area from the hernias arent too big so I’ll be Fine for the Halloween Party and they dont hurt.I had Hernia surgery in December 2006 and STILL went and did a Party @ Sheris Ranch on Christmas Eve , 5 days after my surgery. is it a good idea to go to Sheri’s so soon after surgery, m_ybarra55? The Halloween Party @ Sheris is 2 weeks before Halloween I Heard ( still havent heard from Dena yet ). My Surgery wont be until right before Halloween or Early November. No,it definitly Wasnt a good idea to do a Party @ sherisranch 5 days after Hernia surgery . Looking back nearly 10 years later,it was Dumb.The party i did was with, airforce amy, when she worked at Sheris. NEVER will a do a Party so soon after Surgery Ever again. I was 33 then,I”m 43 Now so I’ve gotten Wiser. Look foward to the Halloween Party there though.Are you Going, FLINT? Unfortunate I live nowhere near the Ranch and haven’t the funds for another trip there this year.